Do you have a 5-9 Year old? Would you like him/her to spend their holidays in a fun yet productive environment? If so, The Zawiya Madrasah is holding its Annual Summer School from 29th July – 15th August 2013. Places are Limited. Our Holiday Schools are themed, and will take place during all school holidays insha’Allah to keep your children learning throughout the year. All classes will be interactive and fun. We have 3 teachers, and 3 volunteers to ensure that we give your child all our attention. All staff DBS (CRB) checked. For a detailed timetable, or for more information, please ask and we will happily provide. Living in the West as a Muslimah, a Female Believer, has become a great challenge and upholding one’s identity has become one of the greatest challenge of our times. Though we face this great test, never despair and always know Allah is sufficient for you. Any trial or tribulation is merely a test from Allah. We have the wonderful privilege of inviting our beloved sister, teacher, companion Ustadha Yasmin Mogahed (USA) in May 2013 which will be her ONLY talk in England. Alhamdulillah this is a great opportunity for the sisters in Yorkshire and across the country. Don’t delay before tickets are sold out, BOOK NOW!!! Exclusive Book Signing, Purchase YOUR Copy on the Day! 1. The theory – As for the Who – that is learning who he the beloved of Allah (s)was and is and that can’t be done unless you learning about him (s). i-Hilya Shareef - this is the abridged one page of the Shamail which has a few verses of Quran and Hadith about the Virtues and Noble Characteristics of The Prophet Muhammad (s). Also the “Nalain shareef-Blessed Sandals“ i would like to add here, Of the proven blessing of the likeness of the Prophet’s (s) sandal is that whoever has it in his possession for tabarruk, it will safeguard him from the sedition of rebels and the mastery of enemies, and will be a barrier against every recreant devil and the evil eye of the envious. If the pregnant woman holds it in her right hand at the time of labour, her delivery will be easier by Allah’s change and His might. See link about Nalain shareef -link to be added. ii-Shamail Tirmidhi - this is a Small book/ text about The Virtues and Noble Characteristics of The Prophet Muhammad (s). The Compendium of Prophetic Beauty – A translation & commentary of Imam al-Tirmidhi’s al-Shamail al-Muhammadiyya By: Muhammad Danyaal. 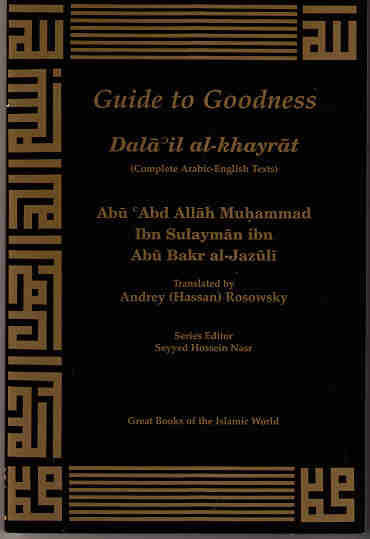 iii-Kitab Ash-shifa of Qadi Iyad this a more detail/comprehensive larger book the full name is Kitab Ash-shifa bi tarif huqub al-Mustafa, (Healing by the recognition of the Rights of the Chosen One), of Qadi Iyad is perhaps the most frequently used and most commented upon handbook in which the Prophets life, his qualities his characteristics and miracles are described in every detail. Also i would like to add reading the Sirah-The Prophet’s Biography. This is usually done in the month of Mawlid on this Birthday classically. 2. The practise – As for the How, so once you have done step one which is to learn Who or the outward understand about him (s) which is also to copy or emulate him (meaning the following his “Sunnah-his way”) why when you love someone you emulate them. Just look at those who love footballers or singers how they emulate them in dress and style and learn about there lifestle and habits. This a Command for all that Believe and is also fard upon Muslims to Love him, praise or not any not abit but abundantly meaning do it alot. Also very important point Salawat shareef that is prays upon him (S) is actual pure Nur-Light that enters the body,mind soul makes it Nur too or part of the Salawat Nur encompasses or engulfs the reader too and cleanses them from sins due to the nature that its an order from Allah, he too is doing it so are his Angels and its the only guaranteed ibadah too and its blessings are endless and reading a powerful salawat shaeef gives more Nur-lights or anwar-lights as the energy it carries is more in powerful and many use them for needs to be fulfilled or problems to be quickly resolved such as marriage, jobs or other personal isssues. ii- Burda Shareef of Imam Busiri is 160 line of poem or Ode there every verse ends in the letter Meem of Poems or Odes – An Ode is a poem that is often written elevated in style or manner and written in varied or irregular meter and is meant to be sung. There are many books of Salawat Shareef and other Odes that can be mentioned but these are the most well known and most ones. Prophet (Salla Allahu ta’ala ‘alayhi wa Sallam) but a cut out man made paper copy. Because the intention is to make and shape it to be in the manner of our Prophets it holds such value and is revered as it has nisbah with the ‘Nalain Paak’ worn on the Noble feet of the Greatest of Mankind. The Image or photocopy which you see in the post is a copy/print are impression together with the description of the Blessings obtained by the Nalain Shareef. They are a lot of Blessings to be obtained by the Nalain shareef and to be kept in a purse for barkat or framed in a wall is very popular. Abu Ishaq said: al-Qasim ibn Muhammad, son of Abu Bakr al-Siddiq R.A, said: Of the proven blessing of the likeness of the Prophet’s sallallahu alaihe wasallam (S.A.W) sandal is that whoever has it in his possession for tabarruk, it will safeguard him from the sedition of rebels and the mastery of enemies, and will be a barrier against every recreant devil and the evil eye of the envious. If the pregnant woman holds it in her right hand at the time of labour, her delivery will be easier by Allah’s change and His might. Certain great Sahaba’s have distinguished themselves with serving the noble sandals. It has been reported by Ibn Sa`d that Anas (Allah be well pleased with him) was the keeper of the sandals of the Messenger of Allah (Allah bless him and give him peace). And Imam al-Salihi reported that `Abd Allah ibn Mas`ud (Allah be pleased with him) used to get up as soon as the Messenger of Allah (Allah bless him and give him peace) sat down, and would take off the His sandals, and place them under his own arms. Then, when the Prophet (Allah bless him and give him peace) would get up, he would put them on him. He was often called ‘the Caretaker of the sandals, couch and water bag’. The Ulema and the A’imma have requested that the Nalain Shareef (sandals) of the Holy Prophet (Sall’Allahu Ta’ala Alayhi Wa’alihi Wa’sallam) to be printed on paper and in books. An actual picture of the Holy Prophet’s (Sall’Allahu Ta’ala Alayhi Wa’alihi Wa’sallam) Nalain Shareef or an impression together with a description of the blessings is utilised to obtain blessings of Nalain Shareef. There are many blessingsfor a person to keep a picture of Nalian Shareef with him. This is not uncommon to see Muslims of all ages wearing badges in the shape of Nalain Shareef. The Ulema have commanded that it be kissed, rubbed over the yes or kept on the head.آ It can be used as mediation, cure for illness and has great blessings. When Musa (Alayhi sallam) went to Mount Toor to speak to Allah Ta’ala he was asked to remove His sandals.آ However, during Mira’j when the Holy Prophet (Sall’Allahu Ta’ala Alayhi Wa’alihi Wa’sallam) went to see Allah Ta’alla He wore His Nalain Shareef but He was not ordered to remove them.Some people say that pictures of the Nalain Shareef of the Holy Prophet (Sall’Allahu Ta’ala Alayhi Wa’alihi Wa’sallam) are doubtful, that these pictures are made of the local ink and paper and, therefore, to kiss this picture is not permissible. 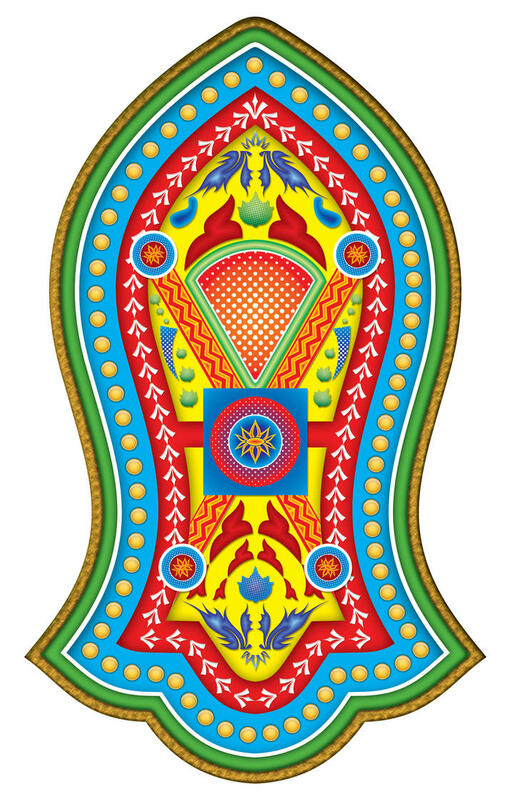 The picture of the Nalain Mubarak is the photocopy of the holy sandals, which were used by the Holy Prophet (Sall’Allahu Ta’ala Alayhi Wa’alihi Wa’sallam) in His life. It bears the description and the related story connected with it. We pay respect to the Holy Qura’an which is printed on the paper with ink or colour used in its printing. Both the paper and the ink are locally manufactured and these were not brought from the Heaven. The Image or photocopy which you see in the post is a copy/print are impression together with the description of the Blessings obtained by the Nalian Shareef. They are alot of Blessings to be obtained by the Nalian shareef and to be kept in a purse for barkat or framed in a wall is very popular. It is mentioned in Sahih Bukhari; That Hadrat Ali (karam Allahu wajhu) was cured of His eye ailment when the Messenger (Salla Allahu ta’ala ‘alayhi wa Sallam) of Almighty Allah applied his saliva to His eye. It is also narrated that Hadrat Bilal (Radi Allahu anhu) used to rub his face on the grave of the Beloved Prophet (Salla Allahu ta’ala ‘alayhi wa Sallam). The practice of Tabarruk was common among the companions of the Beloved Prophet (Salla Allahu ta’ala ‘alayhi wa Sallam) the Noble companions gave the utmost respect to the relics of the Beloved Prophet (Salla Allahu ta’ala ‘alayhi wa Sallam) the companions May Allah raise their ranks, they used to seek blessings from the traces of the Beloved Prophet (Salla Allahu ta’ala ‘alayhi wa Sallam) during his lifetime and death. They made the relics a means for cure in this world and acquisition of Divine Mercy after death. They obtained Tabarruk from His beloved Body, (Salla Allahu ta’ala ‘alayhi wa Sallam) which gave instant results. Below are some of the ‘barakah’ blessings one can acquire by keeping and honouring themselves with a copy of the sacred Nalain shareef. 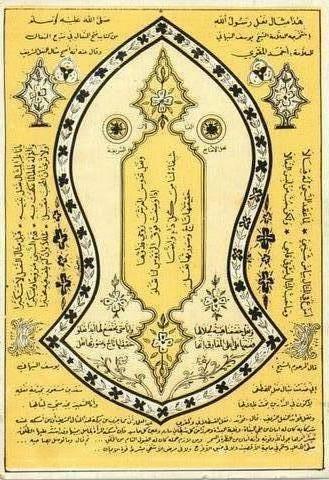 Not the actual or original Blessed shoe/slipper of our Noble Prophet (Salla Allahu ta’ala ‘alayhi wa Sallam) but a cut out man made paper copy. Because the intention is to make and shape it to be in the manner of our Prophets it holds such value and is revered as it has nisbah with the ‘Nalain Paak’ worn on the Noble feet of the Greatest of Mankind. The Great Muslim theologians have listed many benefits and blessings in keeping and venerating a copy of the Nalain Shareef. Some of these are listed below. * The person will be safe from the harms of the cruel, wickedness of the Satan and from the bad sight of the enviers. * The pain of childbirth will be eased for eased for the woman who keeps it with her at the time of delivery. * The person who always keeps a copy of it with him will have respect in the sight of creation. * He will have the opportunity to see the Blessed Green Dome – Ghumbad-e-Khizra in Madeena Shareef. * He will have the honour in seeing the Holy Prophet in his dream. * His property or wealth will be safe in a place where the Nalain Shareef is kept. * A person’s needs will be met when he prays through the waseela of the Nalain Shareef. * A person who keeps the Nalain Shareef for a particular reason will have his wishes fulfilled. * The person will be safe from thieves, calamities and dangers such as drowning. * The disease and ailments go away when the Nalain Shareef is placed over the affected part. * Success and deliverance were gained through the Nalain Shareef in oppressive times. May the best of blessings and peace be upon the owner of these blessed sandals. We are lowered by awe to honour this Sandal. And whenever we lower before it we are raised. So place it on the highest shelf! For indeed in reality it is a crown, though its image is a sandal. Union with Layla, or the world and its treasures? yes i have been crowned as King as well. phir koye mujhse pooche ke tu kya leh? khalqa prasad se pooch ke tu kya lee chand, suraj, sitare, daulat? phir mein bolo keh nalain e muhammad sallallahu alaihe wasallam (S.A.W) ko ankhon se lagaloo!! and then if somebody asks me what do you want? do you want sun, moon, stars, the entire treasuere of the world? then i shall say that i want to put the Sandals of Muhammad sallallahu alaihe wasallam (S.A.W) on my eyes!! 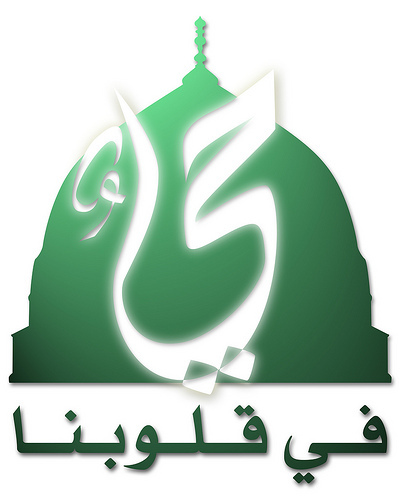 2. ii- Burda Shareef of Imam Busiri is 160 line of poem or Ode there every verse ends in the letter Meem of Poems or Odes – An Ode is a poem that is often written elevated in style or manner and written in varied or irregular meter and is meant to be sung. 1. iii-Kitab Ash-shifa of Qadi Iyad this a more detail/comprehensive larger book the full name is Kitab Ash-shifa bi tarif huqub al-Mustafa, (Healing by the recognition of the Rights of the Chosen One), of Qadi Iyad is perhaps the most frequently used and most commented upon handbook in which the Prophets life, his qualities his characteristics and miracles are described in every detail. links and text to add please visit again .! 1. ii-Shamail Tirmidhi - this is a Small book/ text about The Virtues and Noble Characteristics of The Prophet Muhammad (s). 1. i-Hilya Shareef - this is the abridged one page of the Shamail which has a few verses of Quran and Hadith about the Virtues and Noble Characteristics of The Prophet Muhammad (s). Workshops, speeches, nashids, spoken poetry, bouncy castle, creche, stalls, refreshments and more. Sunday 21 April 2013 at 2pm till 8pm. Stalls: For stall bookings please contact 07427045616. The Blessed Hub | Muslim Youth League UK | Quba Initiative | Faizan-e-Islam Educational & Cultural Trust | Minhaj-ul-Qur’an International | Manchester Central Mosque & Islamic Cultural Centre | Dar-ul-Ihsan | Tariqa Shadhiliyyah | Tariqa Tijaniyyah | Tariqa Muhammadiyyah | Tariqa Azeemia | Tariqa Naqshbandi Aslamia | Tariqa Naqshbandi Haqqani | Zawiya.org and more.